RUFFLE IRONER. If some nice man of science would invent a ruffle ironer, I would gladly mention him in my will. You’ve no idea how much help it would be for ironing curtains, aprons, and dresses. It might be made as an attachment to an ordinary iron, or it could be a special little plug-in gadget. Either would suit me, but if it is hard to operate, I’ll cut the inventor off without a cent! —Mrs. W. H. Fulker, Colorado Springs, Colo.
OUT, DAMNED SPOT! I would like to see a handy device, small enough to fit in a pocket or purse, that would remove any kind of spot from one’s clothing in a few seconds. This would certainly relieve the embarrassment of spilling gravy or other food on the “best dress” while dining out. With the device I have in mind, it would be possible to retire for a minute to the powder room and return with the dress as fresh and clean as before. HAT CIRCUMVENTER. What I want next is a motion-picture theater seat that will raise itself at my pushbutton command so that I can view the screen clearly above some lady’s mad hat or hair-do. This might be done in barber-chair fashion. At least persuade the theater owners to supply a pair of shears so that I can snip off whatever is obstructing my vision. — William A. Berns, New York, N. Y. —Pvt. Thomas Thornhill, Boca Raton, Fla.
EVERLASTING RIBBON. A typewriter ribbon that won’t wear out! This shouldn’t be so difficult as it sounds. Possibly a durable and effective ribbon could be made of glass, plastic, or steel. It should have a constantly renewable ink supply, which might be rolled on by a small absorbent roller attached to an ink cup at one side of the machine. Such a system would be much cleaner and quicker, and far less exasperating, than the present method of wrestling with a yard of smudgy tape. A few drops of ink would probably have to be added at intervals to the supply in the cup. — Charles Feger, Chicago, Ill.
WHISKER CHASER. I want a cream or similar preparation which, when applied to my face and neck, will remove my daily growth of whiskers without the use of a razor or electric shaver. The cream should effectively remove beard or whisker growth without harming the skin. I realize that for the scientists this is a tough one— but so is my beard. Think of all the man-hours that are wasted every day because men have to fuss with shaving soap, razor blades, or electric shavers. —Edwin A. Lind, Reading, Pa.
DRAINCOAT. I want a raincoat with a trough or gutter of some sort that will carry the rain to some place other than my trousers legs or into my shoes. Why protect one part at the expense of another? —J. R. Guinn, Culpeper, Va. I WANT NEXT: Some way of tuning the radio in my car without taking my eye off the road or my hand off the wheel.—R. Strauss, New York, N. Y. Reader Strauss doesn’t know it, but a steering-column radio control appeared on a few 1942 Chevrolets, will reappear on 1946 models. It turns the set on and off, controls volume, and—when pushed—gives push-button tuning of selected stations.—Ed. SCIENCE ILLUSTRATED will pay $10 for every suggestion published. 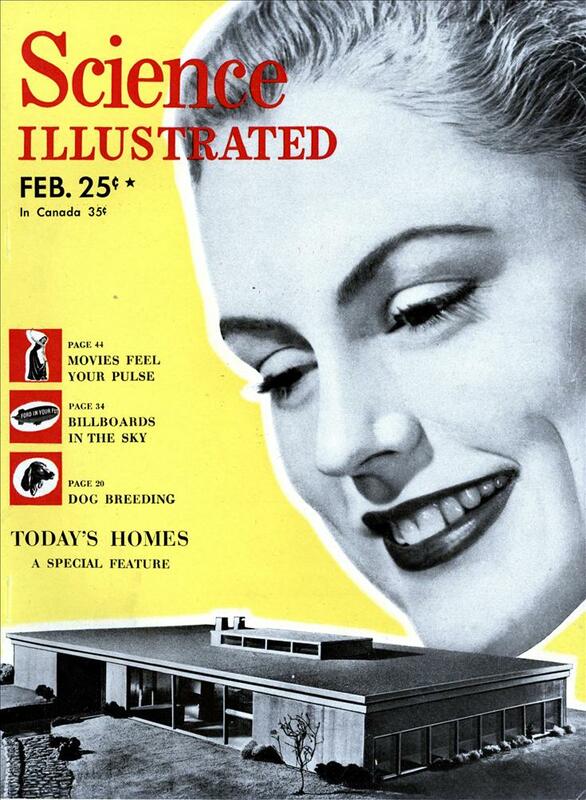 Send them to What I Want Next, Science Illustrated, 330 West 42nd Street, New York 18, N. Y. If an acceptable suggestion is duplicated, the first to reach us will be used. No contributions can be returned. I wonder If Pvt. Thornhill has survived to see the iPad. And Harriet’s Tide Stain Pen, and Edwin’s tube of Neet. Don’t forget Charles’ Ink Cartridge and R. Strauss’ Voice-activated dashboard controls. More to the point is Pvt. Thornhills new Kindle book reading device from Amazon dot com. You can’t read in the dark with a Kindle – they aren’t backlit. HAT CIRCUMVENTER for theaters I could see as being a cartoon gag. Imagine the wars between patrons as they vie for view as each person raises their own chair and the seats behind them are blocked. Bugs Bunny did the gag with a barber chair. Even more fun, watching them fall off or dumping spilled drinks and popcorn down each others’ necks. Pity that we still pay so much for ink. Ink Jet cartridge costs are ridiculous when figured per ounce http://boingboing.net/2… Thermal printers ‘eliminated’ the need for ink but the paper is expensive AND I’ve discovered it turns completely black in the back of my car during sunny desert days. And they made irons to do ruffles pre-20th C called them Fluting irons. I suppose you could hack something up by modifying an electric to heat an old fluting iron. Probably make a mint at SCA meetings by selling them. Argle: The best thing they ever did for theaters, IMHO, was stadium seating; why it took so long to happen, I don’t know (expense and waste of space and such, most likely). As far as inkjet cartridges are concerned; my wife and I got tired of this a long time ago. First, we found that we hardly ever used color, so that was a waste right off the bat; second, we didn’t print much, so the ink would dry out constantly, making the issue of cartridge costs worse. So I went and picked up a nice used HP LaserJet 6MV printer (with only a 25000 page count – very low for these workhorses), along with a new toner cartridge; total cost was about $200.00. That was in 2000. Earlier this year we finally had to replace the toner cartridge (another $70.00). We figure that if we ever really need to print in color, I can do it at my work (we have Dell color laser printer there), or we can take it someplace to have it done. This has yet to be needed, though. The trick is to pick a laser printer meant for business use; I knew how solid the old HP LaserJets were (and since I bought that one, I have purchased others at Goodwill for much less – picked up one with toner cartridge, paper, and the postscript SIMM for $15.00! ), plus there’s no special chipping or such done on the toner cartridges. They may not be fast like today’s laser printers, but I know that when I need to print, it just works, and my consumables are very, very cheap compared to inkjet printers. @Ann, The latest Kindle has an optional leather protective binder with an attached swing out LED lamp. And your local Barnes and Noble has a variety of clip-on lights for dead-tree books. Not exactly glowing ink but I consider the problem solved. 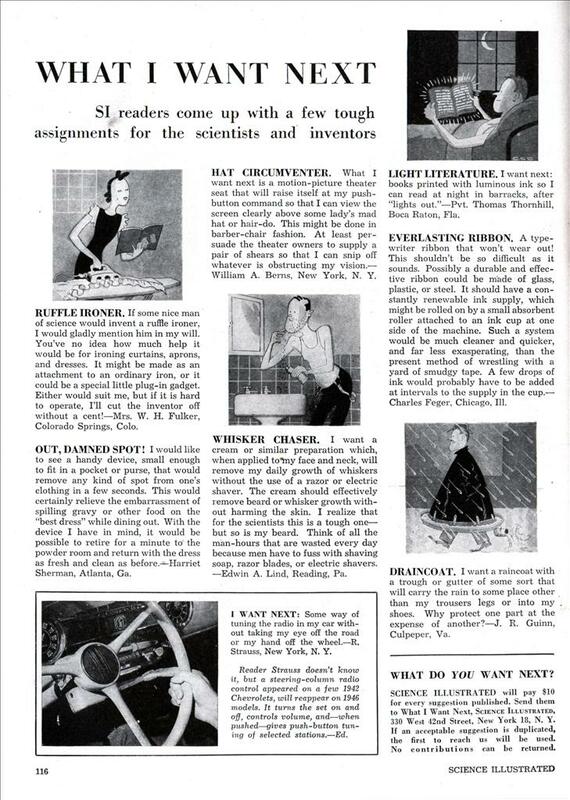 Back in the late 1940’s or early 50’s I submitted a suggestion to Science Illustrated for the “What I Want Next” feature that was accepted and I got my ten bucks. Is there any way to find a copy of that suggestion so I can show my grandkids? The suggestion was to make an ink cartridge to insert into fountain pens. Filling them from an ink bottle was pretty messy. Actually somebody, I think Schaeffer pens, did develop one thereafter, but ball point pens came along about then and pretty well made ink pens obsolete. Bill Brown – very interesting! They still make those cartridges, you know. But “Science Illustrated” doesn’t seem to have been scanned and place online as much as “Popular Mechanics”, etc., so without an exact date I’d say you have your work cut out for you. So if I could figure out an exact date, how would I then find it? Bill Brown: It was published by the McGraw-Hill Publishing Company. You might want to try contacting them and see what archives/records that they keep once you have the date. Once you have the date you can also check various online used book sellers for a specific issue.